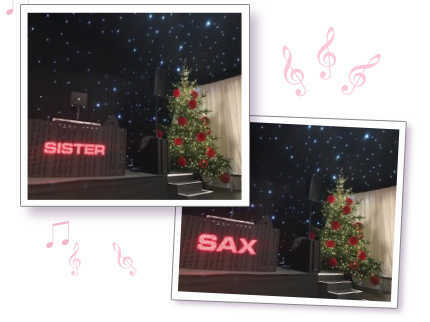 Essex based Sister Sax - Female Sax & singers & vocalists available for Christmas entertainment & special performances. Kay will create the ultimate party atmosphere and Christmas is definately the season to be jolly! Whether you want a good knees up on Christmas Eve, a New Years night to remember or Festive party your guests will never forget! Performing regularly at the elegant Milsoms Kesgrave Hall for their Christmas party dinner dances, Kay has the experience to host an entire evenings celebrations. Her compare skills along with smooth vocals and upbeat saxophone makes Kay the perfect addition to any festive events, intimate or grand. Most clients leave the choice of the music in Kays capable hands. Even so, her passion for perfectly run events will mean she will be in contact with you to discuss the music and offer a selection for you to choose from. Please see below to give you an idea of the Christmas songs which could be included in your booking. Sister Sax Christmas sample tracks..